Members of the SWTJC’s Eta Beta Chapter of Phi Theta Kappa, the two-year college honor society, attended Phi Theta Kappa’s annual national convention from April 4 – 6 in Orlando, Fl, where the chapter was recognized as a Top 100 chapter in the nation. 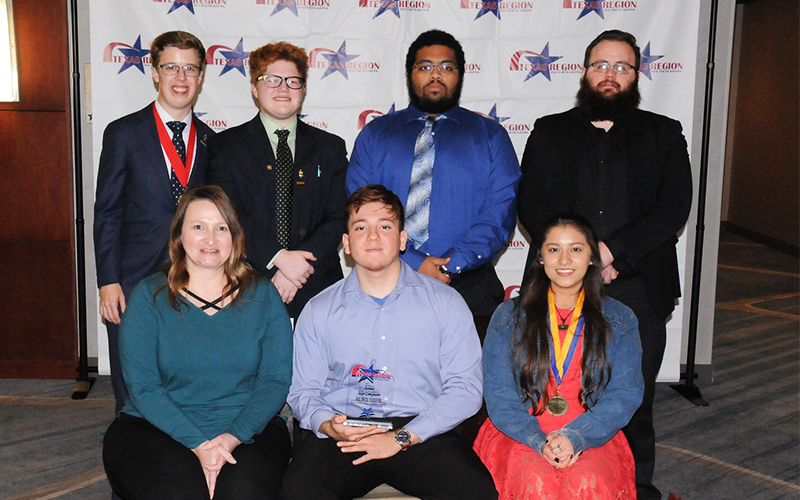 Last month the Eta Beta Chapter members attended the Phi Theta Kappa Texas Region Convention in Houston, where they were awarded multiple awards including a 5-Star Chapter Award, Honors in Action and College Project Participation Award. Honors in Action Lead Member Cathlynn ‘Cielo’ Castro was awarded the Hall of Honor for Distinguished Members Award. The Eta Beta Chapter was also awarded the Award of Merit for College Project and the Award of Merit for Honors in Action Theme 7. Phi Theta Kappa Advisor Dr. Randa Schell was awarded the Regional Coordinator’s Award of Service, Most Distinguished Advisor in Texas and received the Texas Top Chapter Award on behalf of the Eta Beta Chapter. Being awarded the Texas Top Chapter award puts SWTJC in the top 18 of the 50 community colleges in Texas and made the chapter eligible to be recognized as the Top 100 chapter in the nation. According to Schell, members of the Eta Beta Chapter co-presented a workshop at the state convention on the Mental, Physical, and Spiritual Aspects of Leadership, while member Riley Rawald, chapter secretary entered the prepared speech competition.